Built in 1925, this charming bungalow at 3120 Vera Avenue near Culver City appearing in the 1929 comedy Perfect Day is one of the most popular and easily recognizable of all Laurel & Hardy film locations. 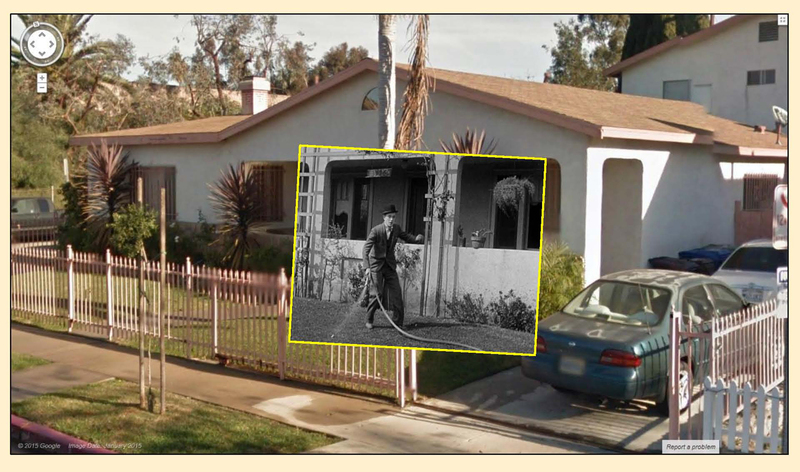 Author Randy Skretvedt reports the home belonged to Hal Roach Studios electrician Bailey H. Boone, which I confirmed in the 1931 city directory. Thanks to Google Street View, and the help of location sleuth Jim Dallape, we’ll see that even more locations reveal themselves nearby. 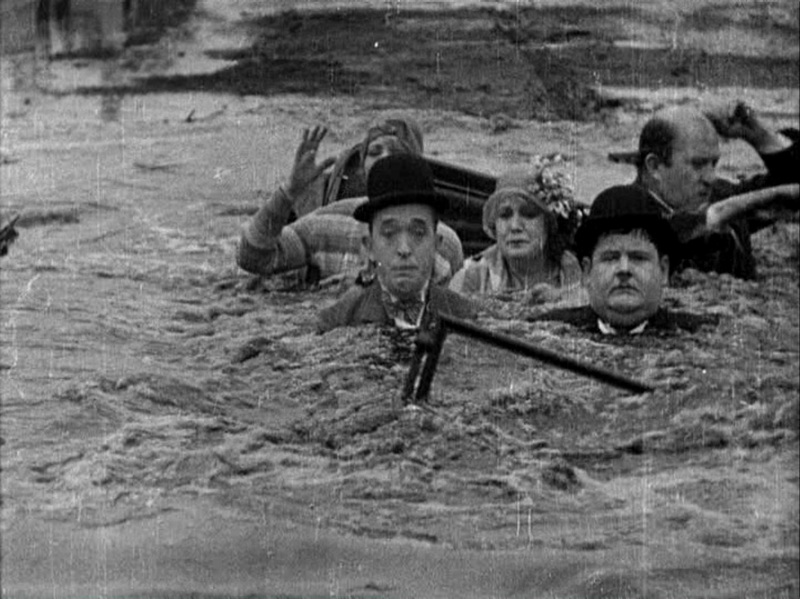 I first learned of this setting reading Pratfall, the 1985 Way Out West Tent filming location guide documenting Bob Satterfield’s many Laurel & Hardy discoveries. 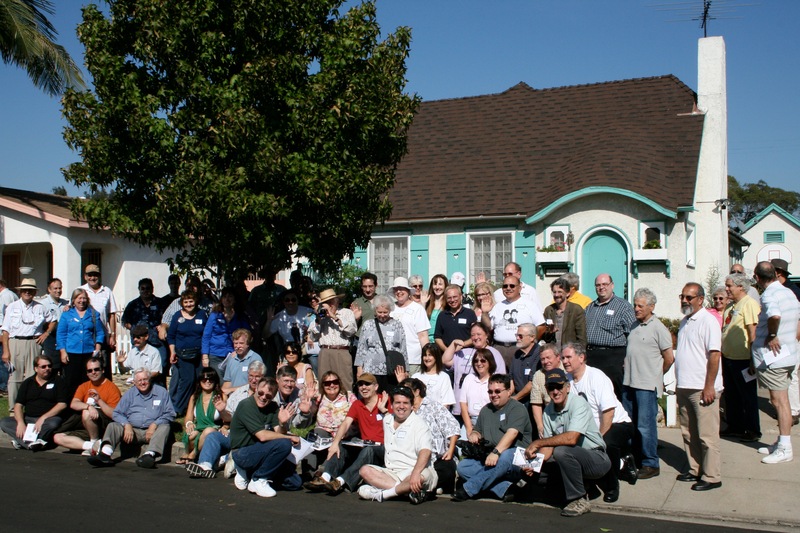 You can see at left a large group of happy fans posing in front of the home during a 2009 tour hosted by the Way Out West Tent, the Los Angeles chapter of the Sons of the Desert International Laurel & Hardy Society. 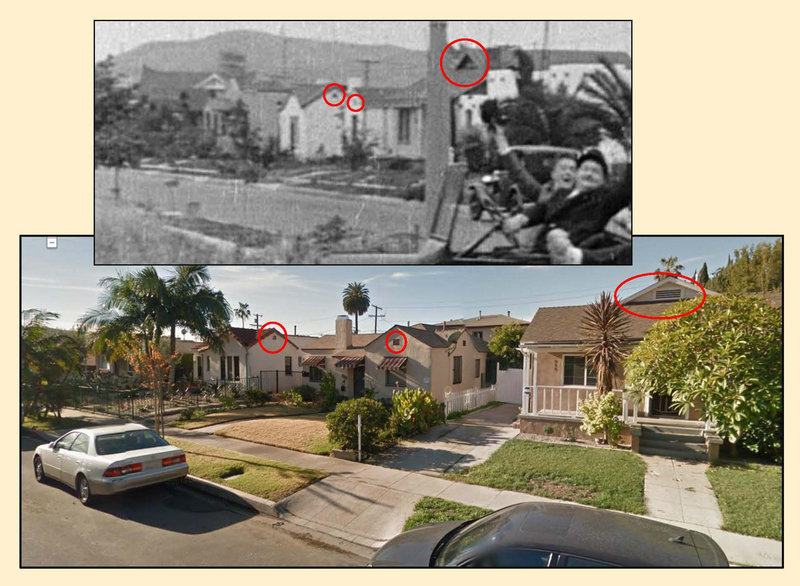 (Jim Dallape and Robert Winslow are co-creators of the amazing Hal Roach Studios Backlot Tour, hosted as part of Dave Lord Heath’s astounding Another Fine Mess website, which provides encyclopedic details about nearly the entire output of the Roach Studios.) For a better view, please CLICK TO ENLARGE each image and map below. Out for a picnic, the family drives past their home. Stan in front of 3116 Vera Ave. Although situated today on a corner (Regent St.), this home once stood three lots south from the original corner of Vera and Bedford Street. Along with Bedford, the north end of Vera was lost to the Santa Monica Freeway, visible at back. 3115 Vera appears at back. The driveway runs under an arched passage-way (yellow) now closed off with a door. As Stan dashes up Vera, a hilltop structure appears behind him. The two candidates are the former California Country Club upper left oval on map, or the former Pacific Military Academy, right oval. The upper right photo shows the club circa 1923. USC Digital Library. Oh how Ollie suffers. Matching porch details (yellow) of 3121 Vera, and a better view of the once open arched driveway (red) of 3115 Vera. Turning left from Ivy onto Bedford. 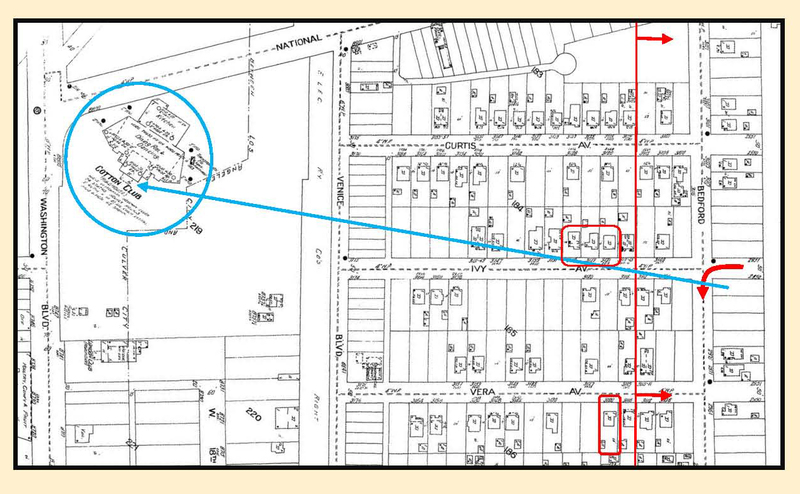 Notice the three visible corners in 1929 were all vacant lots. The Boys started their turn from the north dead-end of Ivy. Everything right of the dotted red line is lost to the new Regent Street and the freeway. 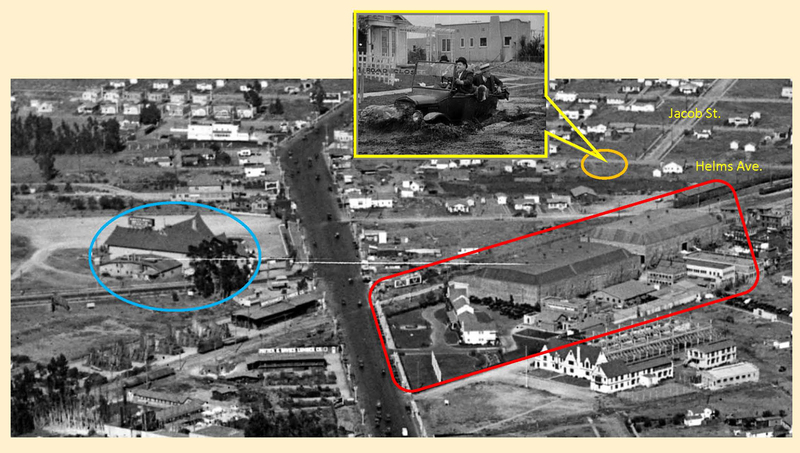 Looking SW towards the Hal Roach Studio (red), Sebastian’s Cotton Club (blue), the Vera Ave. primary filming site (yellow oval), the Boys’ left turn from the dead-end of Ivy onto Bedford (arrow), and the Helms Ave. filming site for the film’s sinking car finale (orange oval). The narrow parallel lines mark the route of modern Regent Street that replaced Bedford, the wide lines mark the path of the modern Santa Monica Freeway that subsumed Bedford and the homes alongside it. The Baldwin Hills and Sebastian’s Cotton Club (blue oval) appear at back looking south down Ivy Ave. LAPL. The curved arrow on this 1929 Sanborn map shows the Boys’ left turn from the dead end of Ivy onto Bedford. The four corners of this intersection were all vacant at the time of filming. The red boxes mark the Vera Ave (bottom) and Ivy (top) shooting sites. Everything to the right of the vertical line was destroyed by the new Regent Street and the freeway. The Cotton Club stood just steps from the City of Los Angeles border. 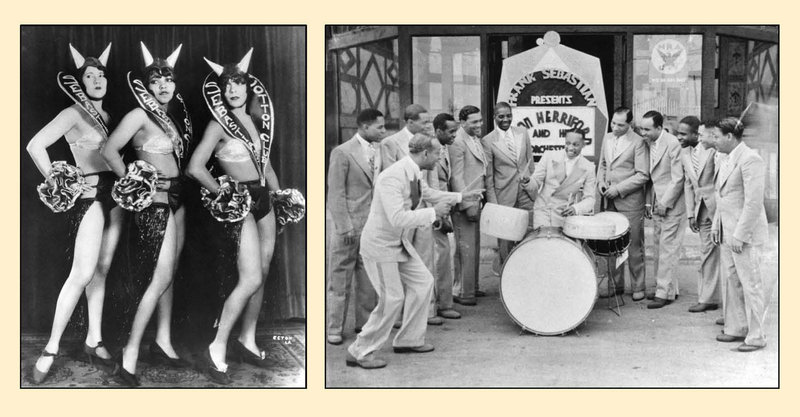 Some of the lively “black and tan” acts to appear at the Cotton Club – Creole dancing girls and Leon Herriford and his Orchestra. LAPL and LAPL. 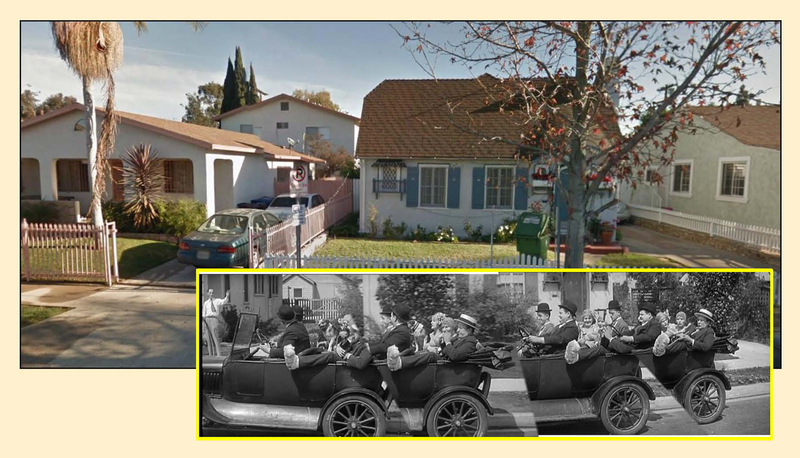 These homes along 3129, 3123, and 3121 Ivy Ave. appear at back as Stan and Ollie make their turn. The ovals mark corresponding details. Looking east at the Cotton Club (blue) across the street from the Roach Studios (red). 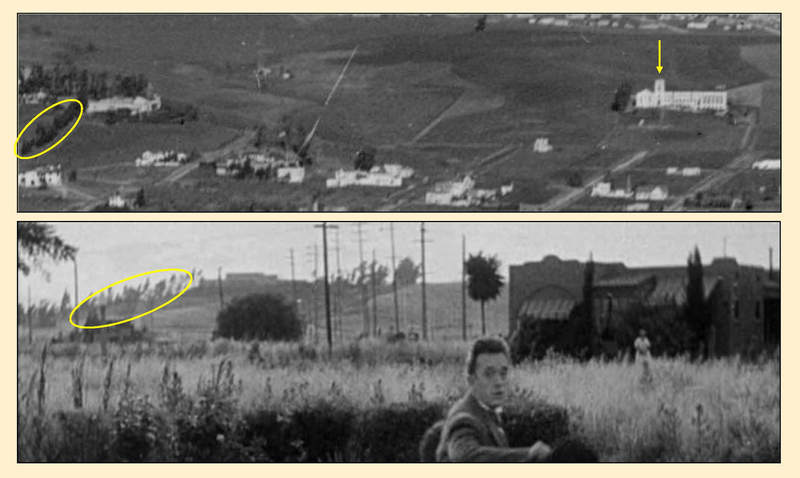 The sinking car finale (orange) was filmed on Helms just north of where Jacob Street meets Helms. Marc Wanamaker – Bison Archives. As the car approaches the Helms Ave. water pit, 3349 and 3341 stand at back, separated by a lot that would remain vacant until 1952. A lamp post beside 3341 appears in both images. Jim Dallape. Perfect Day concludes with the family car sinking in a watery pit. Jim Dallape contacted me last year with his amazing discovery that this scene was filmed on Helms Avenue, close to the Roach Studio. His matching photos above and below confirm the spot. 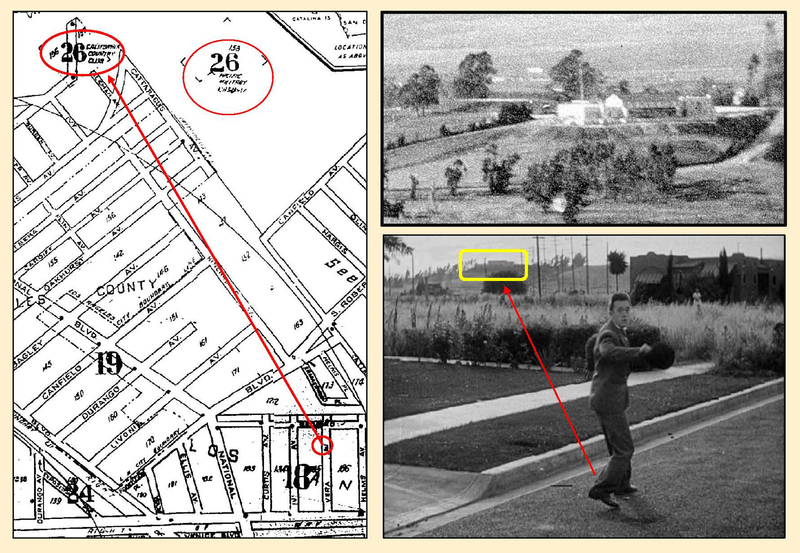 The non-adjacent homes on 3349 and 3341 Helms appearing during the scene were separated by a vacant lot, clearly visible during the final scene, that remained empty until 1952. While other sites have been suggested as candidates for this final scene, including (i) 3125 and 3127 Curtis Avenue, (ii) 9051 and 9047 Hubbard Street , and (iii) 3155 and 3151 Hutchinson Street, they fail to match visually, and the vintage Sanborn maps prove these pairs of homes were never separated by an empty lot. The end to a perfect day – the car sinks slowly with 3349 Helms Street at back. Jim Dallape. My thanks again to Jim Dallape for sharing his discoveries. Check out his Hal Roach Studios Backlot Tour. Perfect Day (C) Hal Roach Studios, Inc. Color images Jim Dallape. Other color images (C) Google. This entry was posted in Hal Roach Studios, Laurel and Hardy, Oliver Hardy, Stan Laurel and tagged Culver City, Hal Roach, Laurel and Hardy film locations, Oliver Hardy, Perfect Day, Silent Comedians, Silent Movie Locations, Silent Movies, Stan Laurel, then and now. Bookmark the permalink. That is absolutely amazing, scholarly work. Just now seeing your e-mail after returning from the terrific, final Cinefest we celebrated last week in Syracuse. I think it was more than 45 years ago when the issue of PRATFALL arrived in the mail with then and now photos of the PERFECT DAY house. I tell you, it was thrilling to see then, and now … all this! This blew my mind how you found these filming area’s after over 80 years with some of these same homes still standing.. This was a real treat so many thanks for your exploration and a fine job! Hi John, I’ve just finished reading Silent Visions and am starting Silent Echoes having also ordered Silent Traces. These books were discovered by chance and I must say they are amazing in detail and quality, I love them. 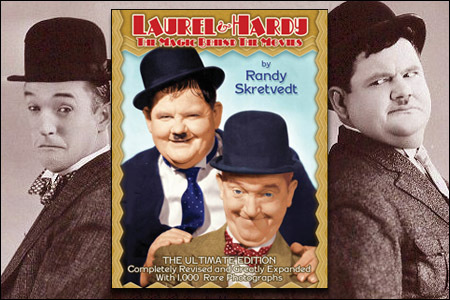 Will there be a Laurel and Hardy book? Now THAT would be a great book! You’re welcome to all my research John! I can never get enough of this! Thanks as always for the incredible research and results! Thank you so much Ron! I hope you can catch up on your sleep! Big Fan of Stan and Olie….You do such a great job with your research and photography. finding the areas years later…..There were a couple of shots I have always wondered about the main one being “Moving a Piano up what looked like a mile of stairs” is that area still around today”? Your detective work is amazing, John. Thank you for sharing your remarkable sleuthing and your enjoyable writing with us.